These were inspired by one of my favorite German treats: Bienenstich (http://rhid-baked.blogspot.com/2007/07/bienenstich-bee-sting.html). Instead of making it a slice I simply made individual buns. These are both milky and crunchy with a touch of honey for sweetness. 1. 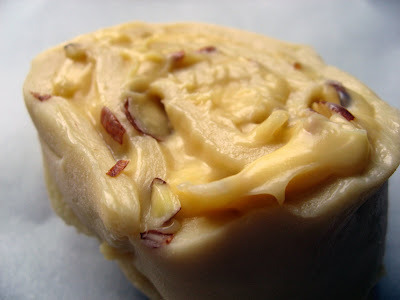 In a medium pan, over medium-low heat combine the sugar, butter, honey and cream. 2.Stir and wait for the mixture to boil. 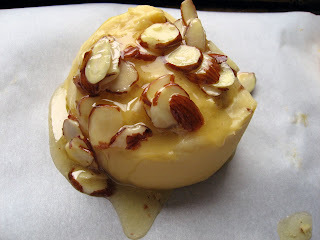 3.Once it has boiled stir in the almonds. 4.Take off the heat, and allow to cool down (10min). 4. Sprinkle on a handful of almonds – crunching them in your palms as you do so. 5. Roll the dough from one of the smallest edges towards the other. Roll as tightly as you can. 6. Here you can wrap the tightly rolled rounds in plastic wrap and freeze for later use (to use frozen, defrost overnight in the fridge then take them out and let them rise for around 1.5 hours and bake as directed below). 7. With a sharp knife trim the dough at the ends. Cut the log into 1 inch pieces. 8. Place on the lined baking sheets making sure to leave room around each. 9. Place 1 Tbs. of the topping on each round. 10. Lightly cover the rounds with wax paper and set the baking sheets in a warm place to rise for 1.5 hours. Dough taken from Dorie Greenspan's "Baking from my home to yours" and topping from "German Baking Today" by Dr. Oetker pp.134-6. These look great too! Keep it coming. Jeez, that looks like heaven in a bun! Very very tempting! These look heavenly! I can almost taste them from here!